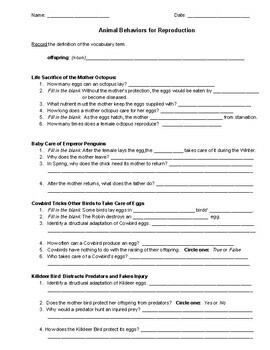 Students record information on examples of behavioral adaptions for reproduction. After reviewing these animal examples, they analyze which species has the best behaviors for reproduction. 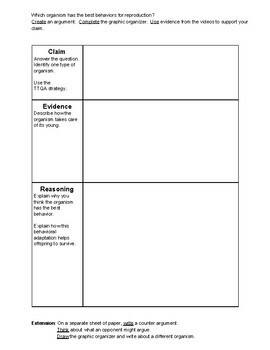 Students use a Claim-Evidence-Reasoning graphic organize to write an argument. All animal examples lay eggs. Four different species (octopus, Emperor penguin, cowbird, and killdeer bird) are covered in the videos in the YouTube playlist. 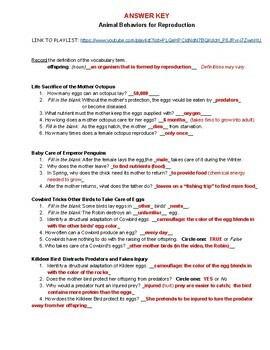 Extension Activity and Answer Key is included.